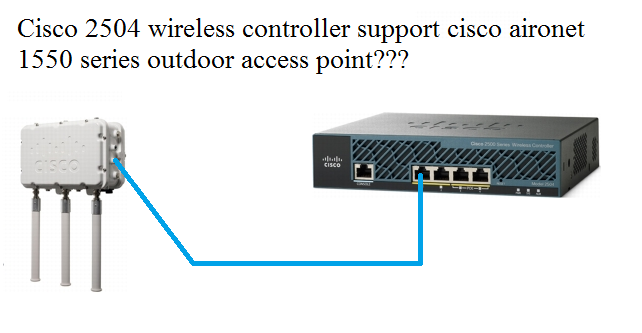 Does Cisco 2504 wireless controller support Cisco 1552E outdoor access point? Access point-WLC compatibility is not usually a hardware issue. It is a software issue. You can’t find in either 2500 or 1550 data sheets what APs or WLCs supported. However, you can check the release notes for the software version that you want to use and you can find if it supports both the WLC and the AP or not. For example, if we pick up software version 7.0.220.0, you can find in the release note that it is supported on both 2500 controllers and it supports 2500. So, if the 2500 controller can run 7.0.220.0 then it should support the 1550 Access points. With some AP data sheets, the software version that is supported is mentioned. However, with 1550 datasheet is not mentioned. This indicates it is not a hardware dependent and you need to check if the running software to make sure about compatibility. Cisco 1550 model WAP is a supported controller model WAP which we can use as a mesh access point. If you look at the link in the very first page itself it show this category as controller supported model. Whatever it matters 25xx or 55xx model the controller supports 1550 model WAP. Please see the below attached image. So that Cisco 1552E model is supported with 2504 WLC. But there is limitation in client associations with 1500 access points with 2504 controller. For 16-MB APs, the limit is 128 clients per AP. This limit is applicable to 1100 and 1200 series APs. For 32-MB and higher APs, there is no per-AP limit. For all Cisco IOS APs, the limit is 200 associations per radio. For all 1000 and 1500 series APs, which are not supported beyond release 4.2, the limit is 250 associations per radio. With 32-MB and higher lightweight Cisco IOS APs, with two radios, up to 200 + 200 = 400 associations are supported. It means that (as per the info you pasted) it has no limit for the clients. Besides, the statement that says: With 32-MB and higher lightweight Cisco IOS APs, with two radios, up to 200 + 200 = 400 associations are supported. It probably indicates 1500 series APs not 1550. 1000 series and 1500 Mesh series are obsolete. 1500 APs includes for example 1505 mesh AP. Cisco 1520 and 1550 APs are on different series than 1500. Just like the Cisco 1000 series. It is different than 1100 series. There is 1010 AP that belongs to 1000 series while there is 1120 AP that belongs to 1100 series.